At one time or another, almost everyone has probably experienced some degree of tooth pain, from minor aches and sensitivity to acute distress. In general, the sensation of pain is a protective response that tells the body something is wrong. But when it affects your teeth, the exact source of the pain can be difficult to pinpoint; it may also come and go in response to other stimuli, like eating hot foods. So what is tooth pain signaling, and what should you do about it? The most common cause of dental pain is tooth decay, a bacterial infection that can spread through many parts of the tooth, and even into the gum tissue. Traumatic damage and gum disease can also result in tooth pain. The only sure way to know what's causing tooth pain is to see a dentist, who will ask detailed questions about what you're feeling and perform diagnostic tests, such as x-rays, to try and identify the exact source of the pain. However, there are some general ways to describe the sensations you may be experiencing — and their potential cause. Constant, severe pain and pressure, swelling of the gums, and sensitivity to touch indicate an infection in the tooth, possibly accompanied by an abscess (inflamed, pus-filled sac) in the surrounding gum and bone tissue. In this case, it's important to see a dentist or endodontist right away — not only to relieve the pain, but also to save the tooth while it's still possible. 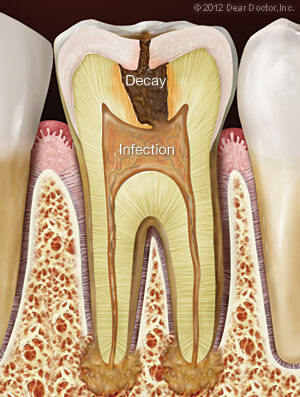 Treatment may include a root canal to remove diseased or dying pulp tissue, and/or periodontal procedures to drain the abscess and stop the infection. Lingering pain after eating hot or cold foods usually indicates disease in the pulp tissue deep inside the tooth. 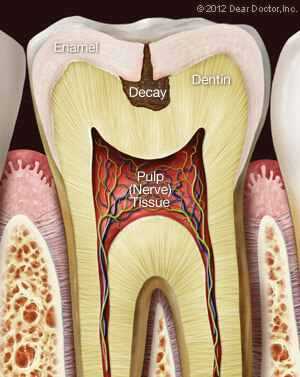 Deep decay or physical trauma to the tooth may have allowed bacteria to infect the pulp tissue or compromise the pulp vitality. As nerves inside the pulp tissue die, the pain may go away, but the infection won't — in fact, it can spread and cause significant damage. Make an appointment to see a dental professional as soon as possible; a root canal may be needed to ease the pain and preserve the tooth. Sharp pain when biting down on food can be caused by severe tooth decay, a loose filling, a crack in the tooth, or possibly by damaged pulp tissue inside the tooth. It should be evaluated by a dentist as soon as possible. Depending on the cause, treatment may involve filling, bonding, root canal therapy, or other procedures. Occasional or momentary sensitivity to hot or cold foods may be caused by a tiny area of decay, a loose filling, or a small amount of gum recession that has exposed the roots of the teeth. To alleviate the symptoms, you can try using a soft brush and toothpaste formulated for sensitive teeth, for a couple of weeks. If that doesn't help, call the dental office to schedule and appointment. Dental treatment itself sometimes causes temporary sensitivity, which can often be relieved by the same methods. If pain persists or grows worse, however, be sure to seek treatment. A severe sinus headache or congestion from colds or flu may cause you to experience symptoms such as a dull ache or pressure in the upper teeth and jaw. When the illness goes away, the dental distress should cease too. Tooth clenching or grinding (bruxism) has also been known to cause this type of discomfort. If you have these habits, you may want to have a nightguard made at the dental office to protect your teeth and jaws from too much force. No matter what type of tooth pain or discomfort you are experiencing, it is important to seek treatment if it persists.